Today’s topic is about an inspirational quote that is often falsely attributed to Walter Scott or Sir Walter Scott. Unfortunately, this misattribution is very popular across the internet and continues to grow like a fungus. The quote virus is hard at work with today’s quote. After surveying 105 infected websites, I found the following statistics. There are two people at the root of this misquote. Both are notable men, and both happen to be named Walter Scott. The first is Sir Walter Scott (1771–1832), the Scottish novelist and poet most known for his literary works Ivanhoe, Rob Roy, and The Lady of the Lake. He was granted the title of baronet in 1820, and thus he is known as Sir Walter Scott. 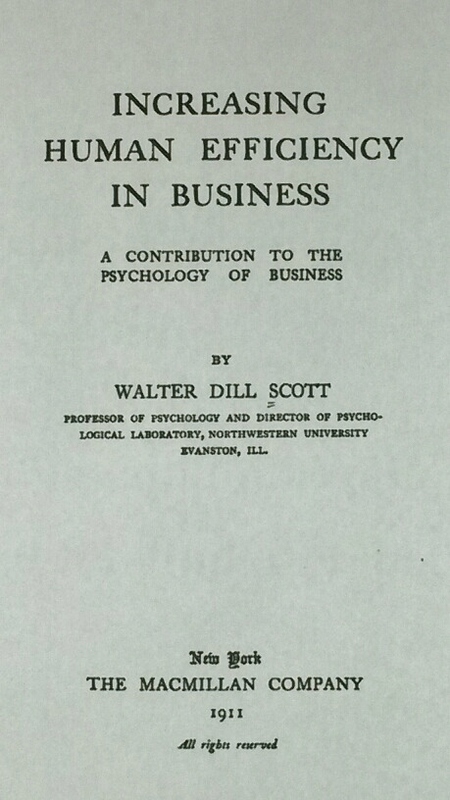 The second is Walter Dill Scott (1869–1955), the American psychologist most known for his theories on organizational and business psychology, and his name does NOT bear the prefix “Sir.” Clearly, they are two very different people who lived in very different places at very different times. Unfortunately for Walter Dill Scott, he is preceded by the more well-known Sir Walter Scott, which means Walter Dill will most likely forever be in the shadow of Sir Walter. Knowing how the quote virus works, we can assume that sometime after Walter Dill Scott published Increasing Human Efficiency in Business, someone must have cited this quote from the book without using his complete name. And since Sir Walter Scott is more well-known than Walter Dill Scott, most people probably assumed Sir Walter Scott was the originator and took the liberty of adding “Sir” to the attribution. Additionally, someone came along and added the word “the” before the words “mental attitude,” and for some reason this version prevailed. With the advent of the internet, we can assume that quote websites took the liberty of adding Sir Walter Scott’s photo and bio to the quote further enforcing this inaccurate information. Today this misquote is so deeply entrenched in the world of quotes that it not only appears on quote websites and in quote books, but it has made its way into the title of a poem written by Sir Walter Scott. See the “Most Amusing Find” section below for full details. This is why it is important to only use quotes that have detailed source information. The author/orator’s name should be accompanied by the work in which the quote is found along with applicable information such as chapter, verse, stanza, line, scene, act, etc. When I researched the quote with the correct wording (sans “the” before “mental attitude”), I found six websites with the correct attribution. So Walter Dill Scott is hanging in there by a thread. My hope is that this post will help educate the world to give credit where credit is due. During my research, I came across a recent publication (2014) of Sir Walter Scott’s poem The Lay of the Last Minstrel. The amusing part is that the publishing company actually added Walter Dill Scott’s quote to the title! 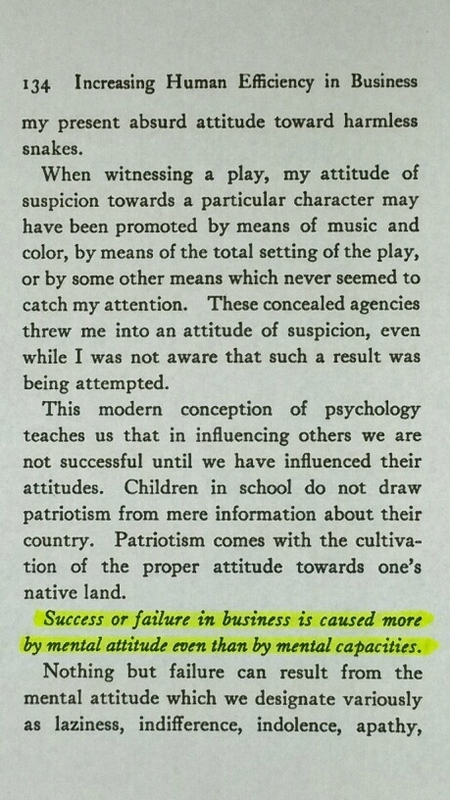 So the new title reads The Lay of the Last Minstrel: “Success or failure in business is caused more by the mental attitude even than by mental capacities.” This egregious mistake will give a lot of power to the quote virus. This publishing company could single-handedly obliterate Walter Dill Scott as the originator—poor guy. I came across five books featuring the misquote, three of which are quotes-only books. All were published between 2004 and 2014. Once again, I must reiterate that quotes-only books are not to be trusted unless they include detailed source information. This means author/orator name, book title with chapter, play title with act and scene, poem title with line number, or speech date and location. If you can easily locate the quote, the source is reliable. Most modern quote books are compilations of quotes and misquotes found in previously published quote books and/or quotes found on quote websites. And as I have demonstrated in the aforementioned statistics (and all previous posts), quote websites are the most unreliable sources for quotes. Like many of the other misquotes I’ve blogged about, today’s misquote is available for purchase. For $22.95 you can spice up your mornings with a misquote coffee mug, or for $19.99 you can have your own fashionable misquote t-shirt. These fine products not only feature the incorrect wording but include the incorrect attribution. What a bonus! The quote virus can only be killed through education and safe quoting. You can help educate by sharing this blog post with friends and family. You can also practice safe quoting by following all the guidelines on my “What You Can Do” page. I would also greatly appreciate it if you would help spread the knowledge by “liking” my Sue Brewton Author Facebook fan page or following @SueBrewton on Twitter. What a great article. I found it to be not only informative but very entertaining. The quote virus is stealing our literary history right out for under us. Keep up the good work Sue.